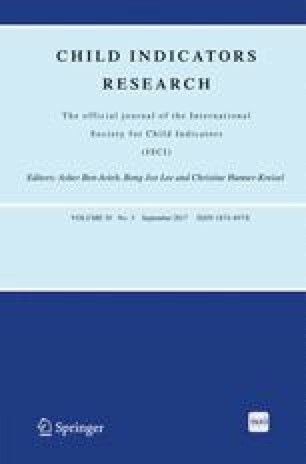 Tensions and reconciliations between work and family are analyzed from Chilean children’s perspectives considering that: 1) The quality of family relationship is key to socio-emotional development; 2) The impact on the lives of the children is undeniable due to the link between economic and emotional dependence; 3) Most studies dedicate special attention to those aspects which affect parents and working organizations, with little focus on the children; and, 4) Results regarding the impact of tensions on children’s development and the quality of their upbringing are contradictory. An adapted Ask the children survey was applied to a purposive sample of 955 children (M age = 13.2, 51 % male). Results show a favorable appraisal of parental competences and time spent together. Work interferences in parent–child relationship encompass the affective sphere (mothers) and communicative area (fathers). Boys would like to work more than their parents did, whereas girls would like to work less than them. Nevertheless, both boys and girls would like to work more than their mothers did. Regarding the worst aspects of having working parents, children reported that is seeing them exhausted and stressed. Still, tensions and conflicts are not perceived dramatically by the children, probably due to some sort of loyalties within the family and the recognition to the efforts related to being absent for long periods of time in behalf family wellbeing. Differences by gender of children and parents are consistent with international evidence. Finally, the discussion of this study encompasses the implications of the conciliation strategies and public and private policies implemented. Lilly, T. (1999). Finding fresh angles of vision. An interview with Barrie Thorne. Work Family Researchers, Electronic Network, 1(2). Visited: https://workfamily.sas.upenn.edu/sites/workfamily.sas.upenn.edu/files/imported/archive/networknews/TNN1-2.pdf. Accessed 19 May 2012. Luk, D., & Shaffer, M. (2005). Work and family domain stressors and support: Within- and cross-domain influences on work-family conflict. Journal of Occupational & Organizational Psychology, 78(489–508). doi: 10.1348/096317905X26741. MacDougall, C., Schiller, W., & Darbyshire, P. (2004). We have to live in the future. Early Child Development and Care, 174, 369–387. doi: 10.1080/0300443032000153426. Romich, J. (2007). Sharing the work: Mother Child relationships and household management. Journal of early adolescence, 27, 192–222. doi: 10.1177/0272431606294837. Schkolnik, M. (2004). ¿Por qué es tan increíblemente baja la tasa de participación de las mujeres en Chile? Serie En Foco N° 33. Visited: http://www.expansiva.cl/media/en_foco/documentos/06102004132738.pdf .Accessed 20 Apr 2012.